Karen Fiorito's Buddha Cat Press enjoyed a small survey show at the Urban Sanctuary gallery in Boyle Heights. BCP has published and produced screen print editions for an impressive panoply of artists. 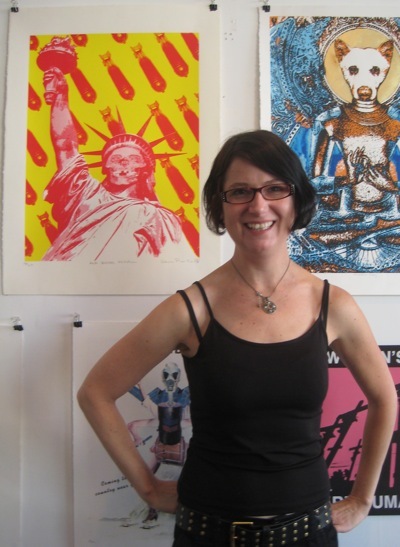 A print from many of these editions was on display along with a large sampling of Karen's own politically charged work. Any small screen-printing publisher would have bragging rights for publishing or co-producing an edition by just one of the many big names that Buddha Cat Press had in this exhibit. 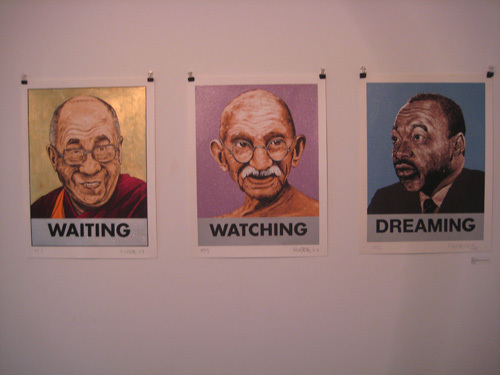 In the show, L.A.'s original street artist Robbie Conal had two triptychs published under Karen's supervision in the past few years, each featuring an iconic portrait (Dalai Lama, Hendrix, etc.) with a slogan underneath which comprise a larger theme and summarize the works of these men. 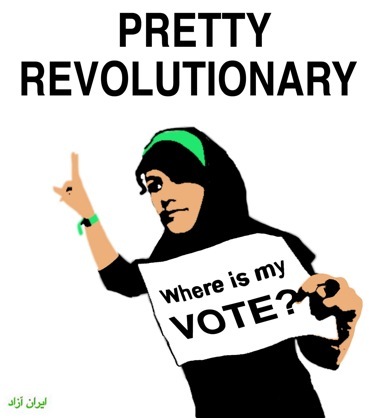 If Conal is too hippie for you, Fiorito has co-published work by Britain's Gee Vaucher, the artist who worked with Crass, as well as Winston Smith, responsible for adding the most arresting images to Dead Kennedys albums. 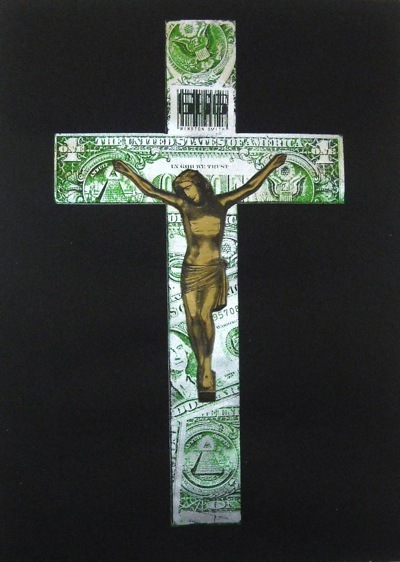 In fact, Smith's image of Christ on a cross of money under a barcoded 666 (the cover of the DK's 1981 "In God We Trust Incorporated" EP) was published (in conjunction with Paperworks Laboratories) last September on black background titled simply "Idol". While Conal, Vaucher and Smith establish a punk backbone and political seriousness to the small publisher, Buddha Cat Press has street credibility too. Urban Sanctuary Gallery had BCP editions from well-known graffiti calligraphists Chaz, El Mac and Retna on display along with a print edition on paper of photographer Estevan Oriol. Amidst these icons, all represented with quality images, expertly presented and hung unframed, backroom style with paper clips, there were fine art prints that extolled themes of beauty and composition. They were without the benefit of an established name; they were, however, exquisite enough that politics were not needed to deliver their message of a search for that tranquil moment of transformation to which all great art aspires. Buddha Cat Press has not printed itself into a corner with one approach to aesthetics or one type of street slogan. It is the epitome of interesting Los Angeles art to draw from more schools of influence than pizza toppings available at a restaurant; BCP epitomizes the making of a melody by embracing the complete cacophony of L.A. that the best art of our time seems to return to again and again. 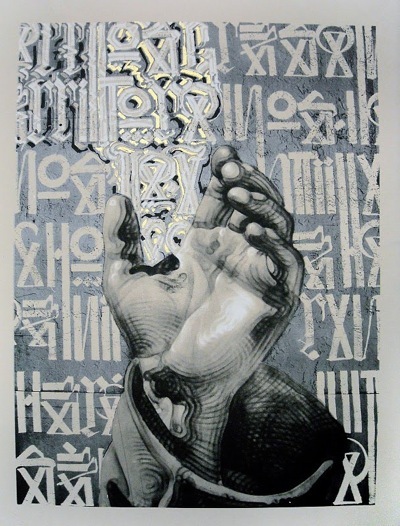 There was no theme to be derived from the wide variety of images in this show save for the possibilities that arise when the personal and the political are curatorially interwoven, when the calligraphic and the organic coexist on the same wall space, and all of it under the precise printing skills of Karen Fiorito.